I don't know the source of the above image — it came from this tweet — but if it's accurate it makes nonsense of the claim, made by writers protesting PEN's award to Charlie Hebdo, that by giving the award "PEN is not simply conveying support for freedom of expression, but also valorizing selectively offensive material: material that intensifies the anti-Islamic, anti-Maghreb, anti-Arab sentiments already prevalent in the Western world" (emphasis mine). If you read the rest of the letter, you'll see that the authors' chief complaint about Charlie Hebdo is in fact that the magazine is not "selectively offensive": it should have, in the view of these authors, have refrained from subjecting Muslims to the same satirical scrutiny it subjects everyone else to: "To the section of the French population that is already marginalized, embattled, and victimized, a population that is shaped by the legacy of France’s various colonial enterprises, and that contains a large percentage of devout Muslims, Charlie Hebdo’s cartoons of the Prophet must be seen as being intended to cause further humiliation and suffering." There's a lot to question here. One might ask why France's Jews are, as far as these authors are concerned, fair game. One might ask, when the authors insist that "The inequities between the person holding the pen and the subject fixed on paper by that pen cannot, and must not, be ignored," that logic might also apply to the inequities between the person holding the pen and the person holding a gun and pointing it at him. But let's set all that aside. 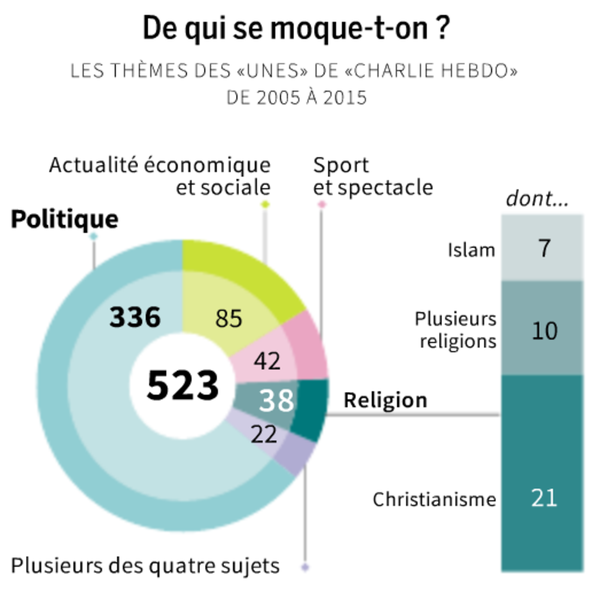 Let's grant, per argumentum, the authors' claim that Charlie Hebdo does wrong by subjecting Muslims to the same critique — though, it appears from the chart above, less frequently — that it subjects others too. Let's even grant that Muslims in France should, uniquely, never be the objects of satire. Does it follow that Charlie Hebdo should not receive this award? I don't think it does follow. Let's remember what the award is: the PEN/Toni and James C. Goodale Freedom of Expression Courage Award. And I don't see how you could say that the people of Charlie Hebdo are anything but courageous — exceptionally courageous. They were brave before so many of them were murdered, and those who remain and keep working are braver still. Yes, but — someone will say — they are brave in a wicked cause! Members of the Ku Klux Klan can be brave too! This argument might have more force if Charlie Hebdo typically singled out Muslims for attack, but as we have seen, it hasn't. In the eyes of the authors who are protesting the award, the crime of Charlie Hebdo is that a magazine whose sole raison d'être is savage mockery did not choose to exempt one group and one group only from that mockery. That strikes me as a wholly inadequate reason for refusing to honor exceptional courage — especially since courage is the one virtue that simply must be exercised if freedom of expression is to survive. And freedom of expression is what PEN is all about.